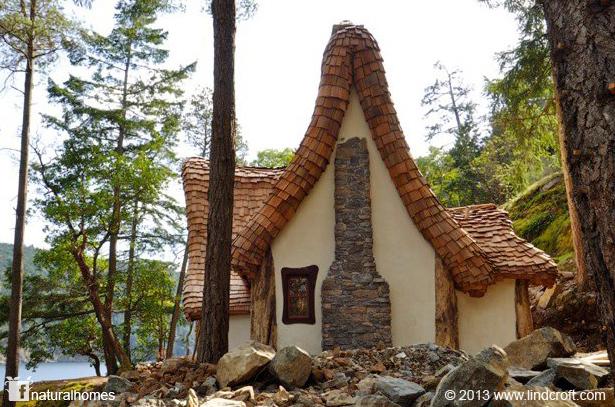 On Canada's Vancouver Island you will find a beautiful example of storybook architecture created by the hands of two creative natural builders Timothy Lindberg and musician Daniel Huscroft. Together they work as Lindcroft, a mixture of their names, building homes that must be the dream of many, a woodland fairytale house by the water's edge. 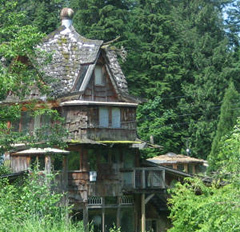 The cottage, called Winckler, was built with local douglas fir, logged and cut with a portable sawmill. 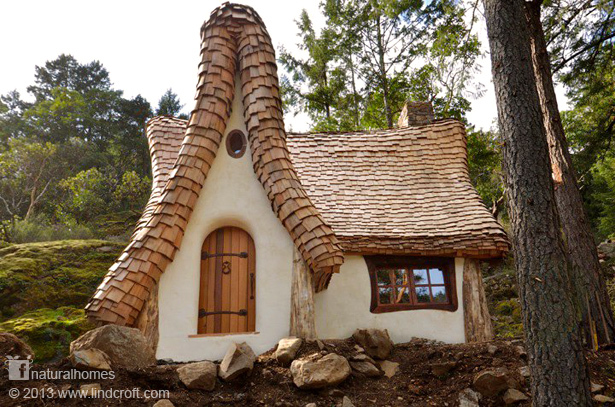 The roof is cedar shingles (shakes) hand split and steamed to make them supple enough to follow the curves of the roof. The cedar door and windows, like the rest of the house, are all handmade. Storybook architecture was popularised in the 1920s. 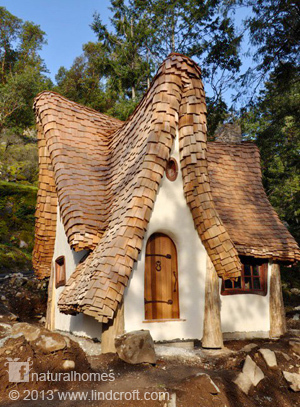 It's an architectural style mixing old English cottage with a playful style inspired by children's books and Hollywood movies. It was popularised by, among others, Hollywood art director Harry Oliver who designed Spadena House, in Beverly Hills, CA, USA. When you build a home like this with un-processed natural timbers that utilise the strength of the roundwood, you quickly discover that a spirit level is not such a useful tool. This style of construction demands a good eye and a sensitivity for the materials you are using, getting the best out of each piece of wood, building something utterly unique. There are few natural builders that have the same sensitivity for natural materials but among them are SunRay Kelly, Simon Dale and Rich Germaney-pope.